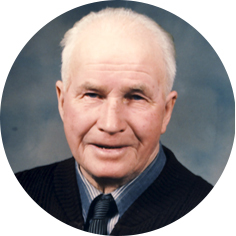 Robert Schroeder Leslie passed away on Friday, December 7th, 2018 at the Craik Health Center at the age of 100 years. Robert was the youngest of three children born to Robert and Matie (née: Schroeder) Leslie in Davidson, SK on November 6th, 1918. He was predeceased by his parents, brother Kenneth and sister Myrna (Martin) Luther. Robert leaves to mourn: his two nephews, David (Frances) Luther and family, and Clifford (Debbie) Luther and family. Robert will be remembered as a quiet man, mainly because Kenny always did the talking. Robert took his education at a country school and high school in Aylesbury, SK. After receiving his education he stayed at home, then joined the Army, after which he returned home to join Kenny on the farm. Together they raised Polled Hereford cattle. He was very proud of the farm and his cattle, and enjoyed doing it the hard way. Robert and Kenny enjoyed visiting with people. The family would like to thank the doctors, nurses and staff at the Craik Health Centre for all of their wonderful care. A Graveside Service will be held on Saturday, May 11th, 2019 at 2:00 p.m. in Aylesbury Cemetery, with a luncheon to follow in the Aylesbury Hall. Flowers are gratefully declined. As an expression of sympathy, donations in Robert’s name may be made to a charity of one’s choice. Arrangements are entrusted to Moose Jaw Funeral Home, 268 Mulberry Lane. Todd Sjoberg, Funeral Director 306-693-4550. My deepest sympathy on Rob’s passing. I am thankful I met him. He was a kind man and it was fascinating to listen to his life story. I especially liked the twinkle in his eyes. So sorry about the passing of Uncle Robert. Yes, he was quiet, but I had some good visits with him when uncle Ken had the floor with someone else. He enjoyed a good laugh. He was always polite. Christel is right, he had that twinkle in his eyes. He will certainly be missed.